A lot of people have been writing about Bill Gross leaving PIMCO and connecting that with us and our forecast that there is a coming bond collapse. I cannot comment on any client or who is a reader or not. Unlike the NSA, I believe in privacy. That aside, there has been talk of a couple of large HF’s reversing short delta positions. The whispers have been highlighting PIMCO! Lots of rumors of blood on the street. The problem with PIMCO is the fact that here we had $2 trillion fund without diversification. It becomes akin to the potential S&L Crisis of the late 80s, where real estate declines and the lack of diversification dooms the industry. This is the direct result of OVER REGULATION. Hedge Funds developed offshore because you could not hire a fund manager to make your decision. You had to decide bonds, equities or commodities and then have the expertise in each area as to what to select. This resulted in specialized funds that perform well only when the specialized sector of their focus performs well. Consequently, a bond fund may be huge in a 31 year bull market, but it can implode in a bear market. 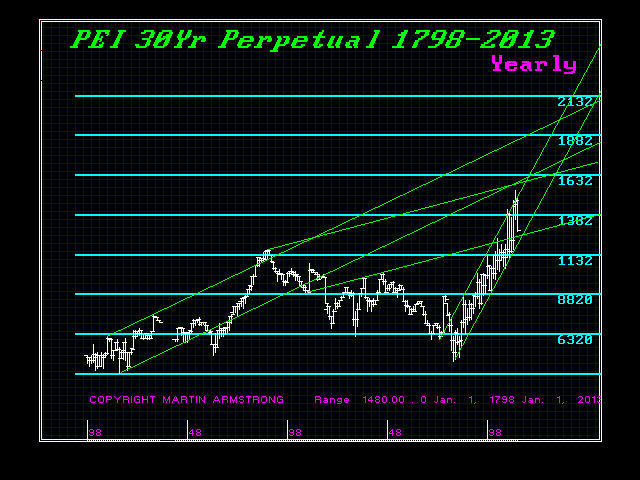 Here is our famous perpetual 30 year futures contract that we recreated back to the beginning of the United States – 1798 The bonds have peaked in 2012 encountering resistance at the 1814 channel and the 1888 channel as well as the 1981 channel. This is Bond Bubble we are warning about. We saw the high 31.4 years from the 1981 low. Short-term rates may still fall to new lows in the final bubble, but it appears the long-term rates may not. The central banks are scared what will happen by raising rates. It is not the stock market they need to save, what happens to bonds? What if PIMCO’s $2 trillion had to be liquidated? Just as most traders had written off the bond markets and pricing in rate rises for US, UK and Canada, this week saw an about turn! Bank Of England’s Weale talked of rate rises being delayed but at the expense of sharper rate rises, “when they come”! Swiss government trimmed growth economic forecast on Euro-Area. Oil also had a rough week on these concerns with prices the lowest since June 2012. Bickering between Prime Minister (Antonis Samaras) blaming the leftist party, SYRIZA, for destabilising the economy soon saw Greek 10’s trade through the 7% level and hitting 9% by weekend (Stocks lost 11% in two days). ECB’s response was to cut the haircut it applies on bonds submitted by Greek banks as collateral to borrow funds! This move freed an extra 12Bln Euro’s “in theory…” Greek 10yr have lost 8 points this week from 98 to 90! Obviously, the Greek curve flattened aggressively as the July/17’s lost 200bp and 10yrs lost 110bp. All this did not set a solid foundation for the OAT auction in France. The result was not great, but then this is the first time in a while that French bonds have been hit in as OAT 30yrs widened 10bp to Bunds. Spanish auction result was also poor not even covering the full size with 10’s snapping 22bp wider to Bunds. BTP’s (Italian government bonds) were the next target; 10yr +26bp to Bunds. 10yr US treasury notes yield fell to 2.09%, their lowest since June 2013. Volume on Wednesday was 5x’s the usual daily volume in cash 10’s. The standout technical picture was of Bunds (Germany) mirroring the JGB (Japan) move of 16 years ago! 10yr Bunds hitting 0.718bp (JGB low was 0.72bp). Even the Fed felt they had to respond on movements this week, stating they are “assessing” the outlook for the US economy in light of current turmoil in financial markets. These comments led to the conclusion the Fed should delay possible rate rises until the second half. Deflation concerns are particularly pronounced in Europe and Japan. The NYT talked of rifts within the ECB during the financial crises in Cyprus, with Jens Weidmann apparently calling privately for ECB assistance to at least one of Cyrpus’ struggling banks to be curtailed. If the NYT really does have a full series of minutes from May 2012 that would include Mario Draghi’s whatever it takes speech! I wonder if that was why they decided to comment?? ?